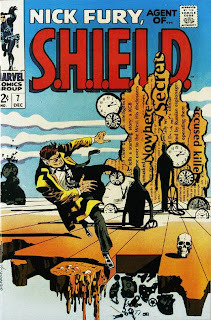 You can say what you choose to about Jim Steranko, but one thing that everyone agrees upon is that he is possibly one of the most influential artists ever to grace the comic book world. 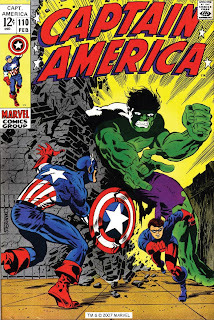 Starting out as a Jack Kirby clone, as did a lot of people, Steranko soon found his own style and what a style it was! 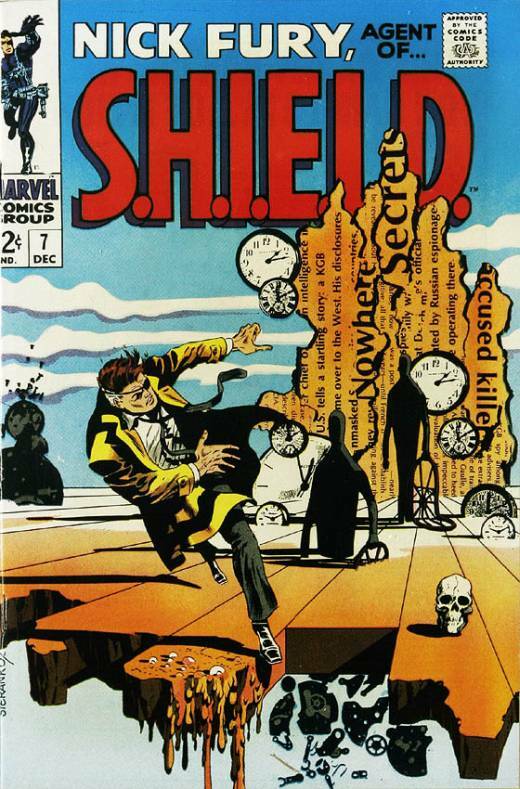 Deeply rooted in film noir and surrealism, Steranko was able to bring a realism to Marvel Comics in the 1960s on the same level as Neal Adams was able to at DC Comics. However, unlike a lot of his peers, once Steranko had made his mark he simply walked away and refused to allow the industry to dictate terms to him - instead he dictated his own terms to the industry and, for the most part, people gave way and allowed him to go his own way. Such was the price of his fame. And as for how influential he is, people still swipe his panels and covers, Frank Miller's Sin City wouldn't exist without Steranko's own black and white work and he could easily walk into any comic book company and be assigned a top line book any time he cares to. Steranko's work might be limited to a tantalising few issues, covers and illustrations, but you can see his line work, his design and storytelling today, over forty years since he came and went. 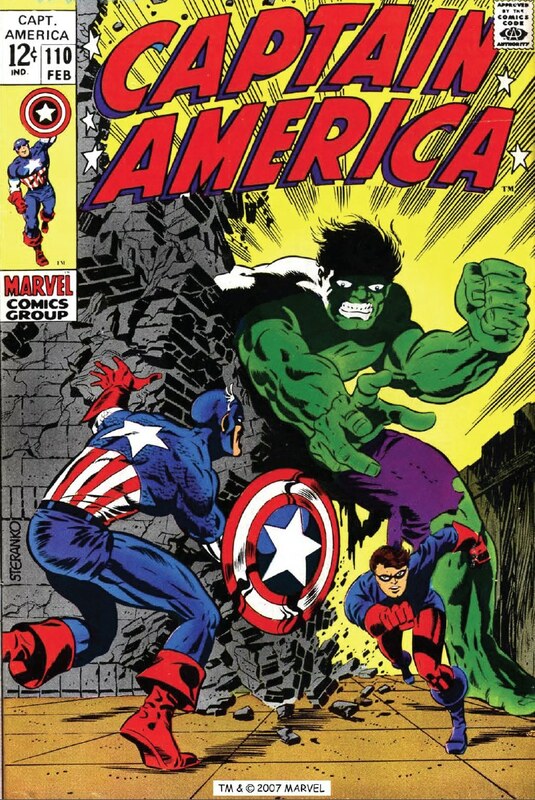 His three issue Captain America arc marked the first time that a major superhero was 'killed' in a mainstream comic at Marvel, and his work on Nick Fury is still considered to be definitive. 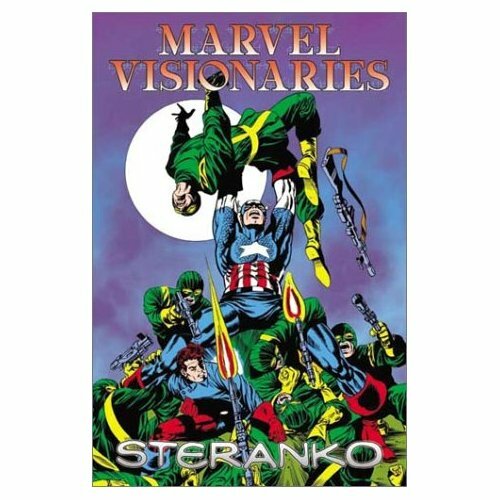 Even after he'd walked away and was busying himself with publishing ventures (The History of Comics, Mediascene) and working in films (notably on Raiders of The Lost Ark, amongst others), Steranko was big on the convention circuit - and he still is, to this day. The following question and answer was done at the Lancaster Comic Art Convention, which was held in Pennsylvania in 1975, shortly after Atlas Comics had folded. The text comes from a short lived fanzine titled Graphex - good luck if you can find it today, although it is well worth seeking out. As you'll read here, Jim Steranko's views haven't changed all that much over time, which, really, is a good thing when you think about it. Q: What was your favorite character while working at Marvel? Steranko: Well, that's an easy question. My all time favorite superhero is Captain America, because when I was growing up I read him, and I feel he embodies the essence of superheroism. When I first started my tenure at Marvel Comics, Stan called me into his office and asked what book I'd like to do. This was when S.H.I.E.L.D. was getting started, and I had an affinity for it because of all the gadgets, gimmicks, ' and the James Bondian type approach. This was due to the things I had done, like being an escape artist and magician. So, I could apply some of those things right into the strip. Incidentally, one of my books, called World of Escapes, was used in the first couple of years to structure some of the material for Mission Impossible. If you re member, they had a lot of jail escapes, little electronic gadgets, picks, keys, concealment things like that. Many of those were from my book. So, I told Stan that I’d like to do Agent of S.H.I.E.L.D. if he had it open, and he said O.K., it's yours. Just like that, it was stunning, it could only happen in the comic books! But, my favorite character was Captain America, and later I asked him if I could do that book. That was when the Marvel superheroes had just broken on TV in that limited animation stuff Krantz was doing. Stan said Jack Kirby wanted to do the book, and the reason he wanted it was because his daughter Lisa saw her dad's name on TV; created by Jack Kirby and so on. Jack kind of felt that he should be doing the book to tie in with the character since he created it so many years ago. 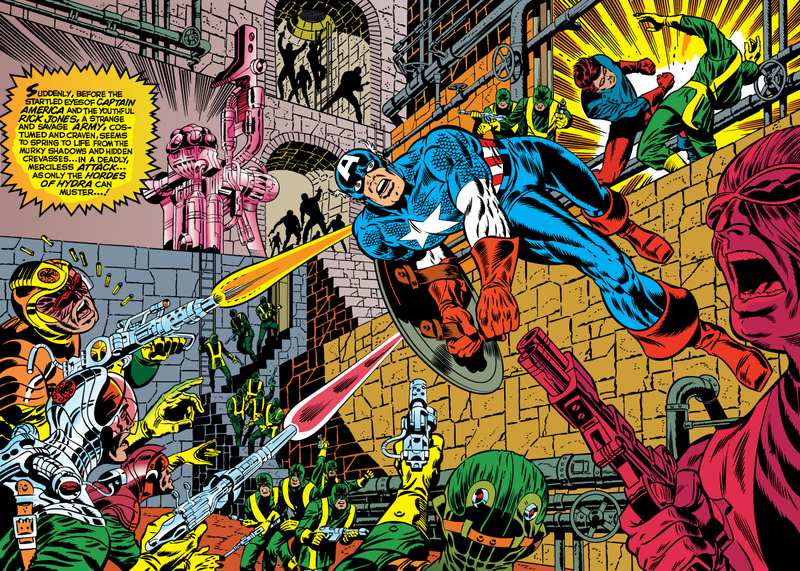 Frankly, I didn't think that was so bad because nobody does Captain America like Kirby does. He does the definitive version, he always has. Q: Which other artists do you know, how about John Romita, Sal Buscema, Frank Robbins? Steranko: Yeah, Johnny I know, but Sal as a matter of fact I don't. I know Frank; he's a terrific artist, but for some reason he doesn't seem to have the fan following that he warrants. But believe me when I tell you that there are very few artists who have the cinematic approach of Robbins, especially in his Johnny Hazard strip. I collect Robbins stuff, the forties right on through. His cinematic approach is incredible. Even more perhaps than Milton Caniff, even though he works in that Caniff or Sickles style. I think he deserves more credit than most fans give him. Sometimes fans think a lot of little lines makes good artwork, but it doesn't. He's a guy who really knows how to tell a story. Maybe like you I've been disappointed with his comic book work, but you have to remember you can't turn out a masterpiece in a week. Maybe that's why there'll never be a comic book 'masterpiece', because when you're turning out one or two books a month, or in Kirby's or Kane's case two or three, it's just impossible. You have to balance it out somehow. Getting back to artists in the business, there are few I don't know, and most of them are pretty good straight guys, real talented. I think they've never really got the recognition that they should have. Perhaps that's one of the reasons that prompted me to do The History of Comics. I thought that while they're still alive; think that comic recognized just like film was recently. Early film was just a novelty and people didn't give a damn. Consequently, there's a lot of film history that's lost; we just can't go back and get it. The guys are dead, and the material is destroyed. I feel that their stories should be gotten down. There's guys like Bill Everett. Fortunately I knew him and got to him before he passed away, I knew him for a couple of years. To wait any longer and we stand to lose a lot of what there is. Q: Do you think that the Doc Savage movie will be re-released, this time with some decent publicity? Steranko: I hope not (laughs). I think it escaped the first time. Steranko: Have you seen it? Q: No, I blinked and it was gone. Steranko: You'd be a little disappointed in it because it was really played for laughs. Although they say Philip Jose Farmer is writing the second screenplay and playing it straight, God only knows what'll happen after they get done with it. See it just to see it. It'll probably wind up on TV in a few years. As I understand it, George Pal bought the option on the entire 180 novels to turn into films. Who knows, maybe the second one will be better. Some of it was pretty interesting. Personally, I think that Ron Ely wasn't right for the character; he's not Doc Savage to me. I cast Doc as a few other people. Who do you think would make a good Doc Savage? Steranko: Doc Savage with a moustache, right. Steranko: I think Chuck is sort of past his prime now for Doc Savage. Some people said William Smith, do you know him? Big arms, a weightlifter, he was in one of the western series for awhile. I felt that physically, Clint Walker would have made a terrific Doc Savage. He has the presence that it takes, if they didn't have him talk too much. He's O.K., he does a pretty fair job in his acting, just as good as Ron Ely. But, he has the aura of suppressed power about him that Doc should have. There's another guy that'd be even better, but it'd be nearly impossible to get him; that's Robert Shaw. Remember him as the assassin in""From Russia with Love"? The train sequence where he fought James Bond? He's got the blue eyes, the powerful look. He's in "Jaws" as the old fisherman. Except he's a Shakespearian actor. I doubt that he'd be involved in a Jack and the Beanstalk production such as Doc Savage. But, that'd be good casting, him or an unknown. I don't even know who's going to be Superman. I think it'll be an unknown because it's hard to get around that image. Q: Do you know when the superhero movies are coming out? Steranko: Which ones? Steve Krantz holds all the options right now. I understand there's a Spiderman movie in the works, but I'll check it out and report it in Mediascene, what else? The Comic Reader won't have it (laughs). Was that Angela Bowie in Time as the Black Widow with someone else as Daredevil? I think that was a publicity puff, probably nothing. Q: They turned her down for Wonder Woman because she wouldn't wear a bra and they said it looked bad when she jumped off things (laughs). Steranko: You're probably right. Maybe David Bowie ought to be in the role; David Bowie as the Black Widow. Q: Are you planning to write a scathing editorial to the U.S. Postal Service about not commemorating the hundredth anniversary of Edgar Rice Burroughs? Steranko: Hell, I couldn't care less (laughs). They might, anything goes these days in stamps. Q : What about the third History of Comics? 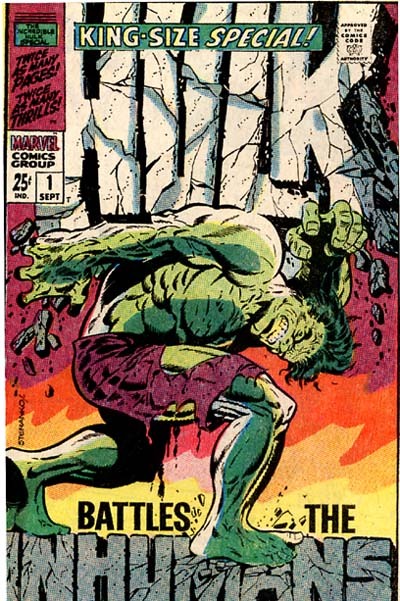 Steranko: What about it? Actually, it's very late. When I originally created the idea I thought I'd be able to do one book every two years. I would, but I'm committed to too many other things. Q: When are you going back to Marvel? Steranko: I was just up there last week and I used their telephone (laughs). It's hard to tell, in the business everyone crosses back and forth and I think I got out just in time. First of all, it's a matter of dollars; I can make more money elsewhere with less hassle. I can just paint paperback covers or do illustrations and be more satisfied. Q: Which story of yours did you like most? Steranko: I think "Who is Scorpio?" which was in S.H.I.E.L.D. #1, and my favorite shorter story was Strange Tales' "Today Earth Died". Q: What's the deal with Byron Priess? Steranko: Byron's an old friend of mine who wanted to get into the publishing business, and he has lots of good ideas I did a few illustrations, the logos, and the cover for his Weird Heroes book. I must tell you now, even though Byron should be here to defend it; I did the covers exactly the way he wanted them done. They were not my ideas, even though I submitted roughs and roughs and more roughs until they were coming out my ears. They’re not really Steranko covers, they’re Byron Preiss covers. I painted them exactly how he wanted them done because he's the publisher. As a professional, especially in this case because I like Byron, I wanted to give him exactly what he wanted because it’s his money that's on the line. With somebody else, I might have said look, you either have it this way or get somebody else. But not in Byron's case. So, when you see them and you don't see anything wildly exciting, like I couldn't get excited by this thing, don't blame me. It was Byron’s project. Q: Is Larry Leiber going to go back to Marvel now? Q: Do you know of any-other issues that weren't released by Atlas? Steranko: I think they used-up most of their inventory. Atlas is done for now, but comic book companies are like comic book villains; they keep coming back after they die. I wouldn't be surprised maybe in the spring of' 1976 Atlas might come out with a few titles and maybe get on its feet again. By the way, I saw the Alex Toth version 'of the Scorpion and it was completely redesigned, new storyline, new everything. It was a nice story; it's a shame that somebody couldn't have used it. 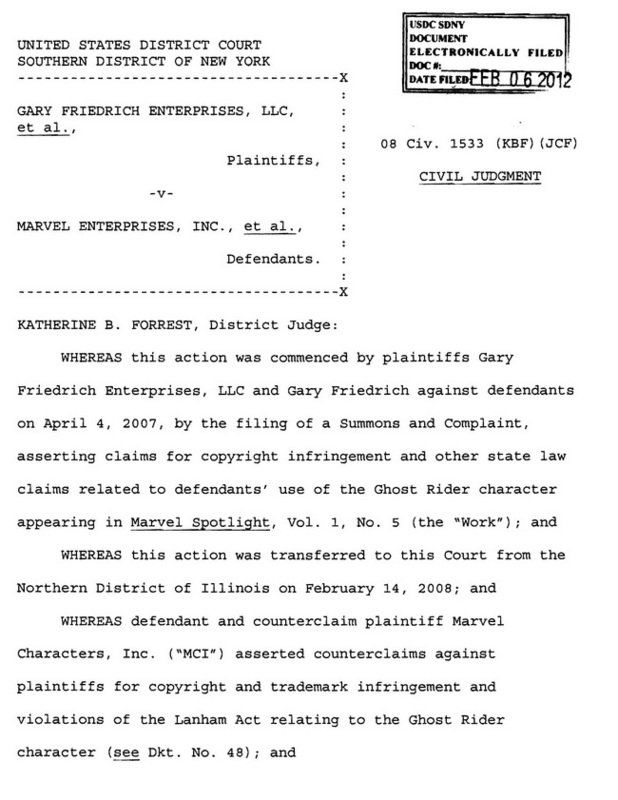 There was some talk of Marvel buying it, but it doesn't look that way now. Q: Would you really like to go into films, and if so, what would you like to do in them? 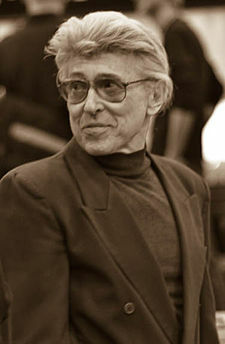 Steranko: I have done some film work. Matter of fact, just a few weeks ago when I was in Hollywood I saw a film that I had made two or three years ago. It was a film I had never seen, and it was surprising because it was at a screening of Roman Polanski's "Repulsion". As a warm up they showed my film, I didn't know it was scheduled and blam, it was just there on the screen. I've worked with Alan Renais who's done films such as "Last Day at Merionbath" and "Hiroshima Monomota". A very influential filmmaker who was responsible for the jump cut coming back instead of the lap dissolve type of transition. I don't know if you know what I'm talking about or if you want me to elaborate, but his technique that he used in those films are now commonplace. We worked on a film together four or five years ago, a film that is yet unproduced because it was too expensive. So, what I'm really trying to say is that I've been involved in film and I'd like to go back and do more things in it because that's the ultimate form of storytelling. By definition, a comic book and a film are really the same; a comic book is just panels, scenes adjacent to one another on a page and your mind puts the action together. A film is exactly the same, they're just pictures all adjacent to each other, except you don't have to do the work anymore, it's done for you. So, film is really the ultimate goal as far as I'm concerned and a lot of other comic artists too. I don't think there's but a half dozen guys who don't care about film. All of them are film nuts, they all work with the TV on, like Kirby, he does all his work with the TV set on. He turns the sound down because he knows the dialogue by heart by this time. His whole life he's worked with that eye staring at him. We all do. Q: Has there ever been a straight superhero film, and if you were to do one how would you do it? Steranko: I wouldn't care to do a superhero film, I'm really not interested in that type of thing. I've never seen it, but the closest to that type was "Danger Diabolic" with John Phillip Law. If I ever worked in film, I'd do a western or a thriller suspense thing. I'm interested in telling a real good story, and I'm not sure you c could do that using a superhero format as a vehicle; it just over blows the situation. Maybe James Bond is about the closest that will ever be done. Q: Would you care to do a Shadow or Sherlock Holmes film? Steranko: No, I don't think so. I've seen most of the Shadow films, and they were incredibly retched and boring. Sherlock Holmes to me - well, Basil Rathbone was Sherlock Holmes and I felt that they were the definitive films. I'm more interested in the Robert Siodmak, Hitchcock type of thing. I think that I could do that better than anything else. We'll see. Q: What do you think of Ken Smith's work here in the states and the European comics; what they're trying to do and where they're at? Steranko: I think it's terrific. I don't think that Ken is involved in the European approach, he does what he does. Some of it's good, some of it isn't. I really haven't seen much of his work. The Europeans are doing some interesting things. They have a completely different system: they keep the copyright, the artwork; they control the books, the material, and so forth. Over here it's just the opposite. Comic book artists are princes over in Europe, here he's nothing. In the structure of the industry he's the lowest. He gets paid the least but has the most to do with the success of the book. I can't figure it out; it'll probably change in about ten years. Q: The Philippine artists who in the past two or three years have been brought in, mostly at DC first, have what I feel is a radically different way of telling a story to which neither Marvel or DC is used to. Some of them are trying to switch to the Marvel style, but aren't making it. Would you agree that more than pictures, which they were presenting, the most important point is storytelling, and that they have a decided difficulty in telling a story? Steranko: I agree with you completely. They're very interested in the artwork itself, the pretty picture. That's not to say that there are not Philippine artists who are, in fact, magnificent storytellers. I'll tell you about a guy you never heard about, his name is K'Ching. Not only is he the best of the Philippino artists, he's the best storyteller. He's so good that he could probably blow most of the American guys right off the stage. He does a lot of the comics down there, westerns, everything. Let's take for example Alex Nino. He has an idea about how he wants to tell a story. He tries to use the comic book cinema approach, and he does some stuff that's very interesting. But, he's too wild, confusing, chaotic. I don't believe in that chaotic approach to storytelling. A few years back, there was an entire movement devoted to confounding and perplexing the reader. The pages were fragmented into shards like broken glass; you couldn't tell where to go next. Occasionally, they'd even have arrows, I couldn't believe this! Professional guys putting in arrows telling you where to read next, this was stupidity! If you have to do that you're lost. You can't tell a story with arrows, you have to flow from one panel to the next; you have to get involved in the story. The Philippinos have the traditional approach. They're excellent draftsmen, like Redondo. There are not too many people in the business that can draw as good as him, and render like him. He does tell an interesting story, he's not way out like some others or the Europeans who just can't. But, they're so talented that it will take them little time to understand the American style, pick it up, and surpass us. As a matter of fact, I think they're probably doing that right now. Q: Is that why Marvel didn't move to hire them at first, because they have such a shop idea of the way to tell stories? Steranko: Not exactly, there are a lot of reasons why. They had to wait until there was dissent in the ranks. All the Philippinos signed up with National, and then maybe they decided they weren't getting the best break or something. Then all the sudden Marvel shows up and say that we'll give you five more dollars for this, your artwork back, and this. So, O.K., we're open for business, right? I think you'll see Rudy Nebres - fantastic illustrator, he really knows. Maybe after looking at American books for a year or so, having someone do the layouts and having them edited, he'll be one of the real giants around. Hopefully there will be a transition; the Americans will learn to draw better and the foreigners will learn to tell a better story. However, you’ll benefit from it because you'll get the best of everything. Q: But isn't it just a matter of how much time you can spend on a drawing rather than your ability? Steranko: Drawing well is requirement in being a comic artist. But, it's not the drawing, look; you want to be in this business you draw well! If you don't, you don't go out and dig a ditch, shine shoes, or something else. Even in my case, I don't consider myself an artist because there are so many guys that draw better than I do. I tell a story. Drawing is understood, it has to be there, it's not the most important thing, but frequently it turns up to be that way. This pretty picture syndrome is not a good thing. I mean there are guys who will bring their portfolios to art directors, like Romita, and all they show are single illustrations. And as nice as they could be, it doesn't mean anything because they want to see what you can do in sequence. 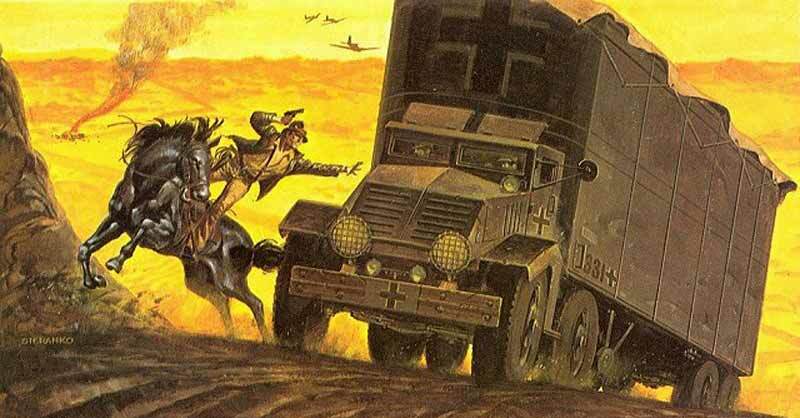 Q: What do you think of Paul Gulacy's artwork? He's developed separate from your influence, but he's similar and different at the same time. Steranko: Every time I stand up before 'comic book freaks' I'm asked that type of question. I know Paul personally, and I like his work. I like it because it's like seeing my own work without having to do it. I think that he'll just use that style before moving on in his own direction. I think you'll see some very surprising things coming from him in the next year or two; he's got a lot of talent. Q: Who do you like that's 'coming up'? 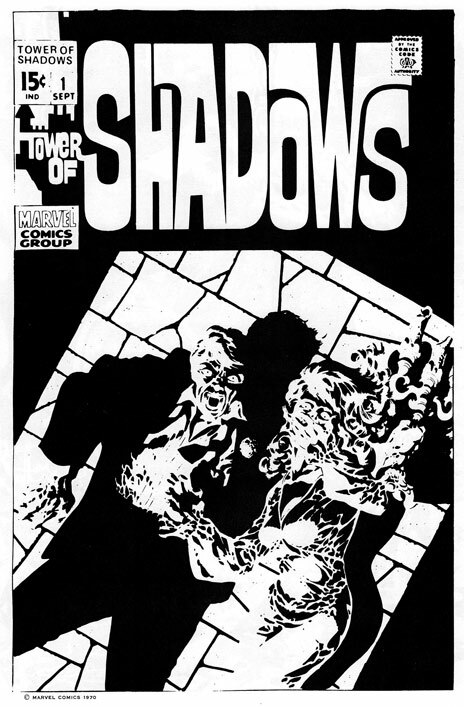 Steranko: Well, there's Gulacy, then there's Craig Russell's work, he's a very talented guy and there's a lot of surprises in his work, a very interesting approach. Steve Gan, I think he's a remarkable artist for what he is. There's not too many surprises in his work, but he's very craftsmen like and I like his style; a nice loose approach that's refreshing from the usual stuff. Simonson tells an interesting story at times, if he could learn to draw a little better. He probably will, I'm sure. He’s a guy to keep an eye out for. Then there's the Europeans who are already here, but we'll hear more about in the future. Q: Do you like Val Mayerik's work? Steranko: Val looked to be one of the great new talents recently, but I don't think he quite made it. He hasn't developed, enough, not fast enough for me in any case. However, he's very good, he's self taught, and he's improving all the time. Frequently lie gets stuck with some very bad inkers, and they can really butcher a job. Bear in mind that the stuff you’re seeing isn't the stuff Val is doing. Val has an idea now that he wants to go to Hollywood and be a stuntman, and he probably will. He's a martial arts teacher, and he's got kind of a head start. He's a good guy; he's good at most things he does. Well, I guess we'll wrap it up now, it was nice to be here, and I guess we'll 'do it again next year. Thank you. Wonderful blog here. I can't say enough how much I appreciate good writing like this and keeping the classic comic art alive. "Last Day at Merionbath?" "Hiroshima Monomota?" Clearly, the original transcriber wasn't much of a film buff. Fantastic article. I found you because I was scouring for pictures of Angie Bowie as Black Widow for my own site, had to click your link when a shot of Steranko came up, as he's a hero of mine. Keep up the great work.